● Tests for disconnection sensitivity. ● Tests for disconnection time. ● Measures voltage phase to earth. ● Select one of 3 Phase to test ELCB. ● Phase presence indication from as low as 100Vac. 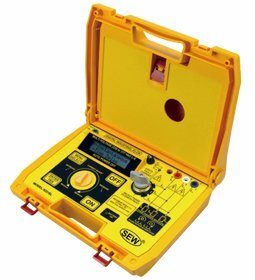 ● Fused earth leakage tester. ● ELCB works 50Vac to 330Vac 50Hz / 60Hz. ● Led indication of Voltage on ELCB. ● Phase rotation and presence does not require battery to indicate. neon lamps L1, L2, L3 to lit up) From 100Vac to 450Vac. Frequency Range From 10Hz to 400Hz. indicates) From 100 to 450Vac. Frequency Range From 2Hz to 400Hz. Over Voltage Class III - 450V towards ground.